Halloween is coming and I'm sure some of you will like to enjoy this cute and fun movie! 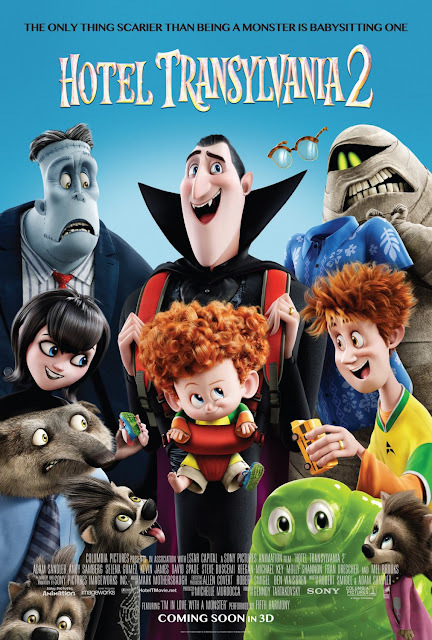 I remember watching the first Hotel Transylvania at tv and really enjoyed it, so when I heard there was a second movie I got really excited. It didn't disappoint me! This time Mavis and Jonathan get married and have the cutest son Dennys. Dennys is perfect but he seems to be human, not a vampire, and being a little human living in a hotel full of monsters can be very dangerous. So his parents plan to move to California for him to have a normal human childhood but his grandfather Dracula can't accept they move away and is going to do everything for his grandson to release the vampire that must be inside him. Hotel Transylvania 2 was fun and sweet, everybody was laughing and overall we had a great time. Totally recommended for a not-so-scary Halloween.